Today’s weather will be wet and mild throughout the day with gusty morning winds which could turn into gale-force, later. 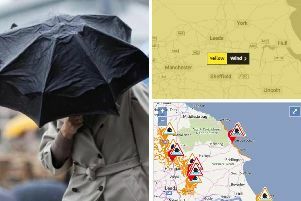 The Met Office has issued yellow weather warnings for rain and wind and warn drivers they may face disruption on the roads as a result of the weather. Temperatures will reach a high of ten degrees c between 2pm and 6pm, today (December 21). Traffic is flowing smoothly across the region - we will update you with any changes throughout the day. Don’t forget tweet @hxcourier or email newsdesk@halifaxcourier.co.uk with your news and views.